Standard breakfast for me used to be a couple pieces of toast, one with jelly, one with peanut butter. For the past month or so I’ve been trying to eat more whole grains. I started making pots of brown rice or quinoa every few nights to eat the next morning. Then I tried toasted buckwheat groats (also known as kasha). It’s become one of my favorites. Most people tend to want something quick and easy for breakfast. 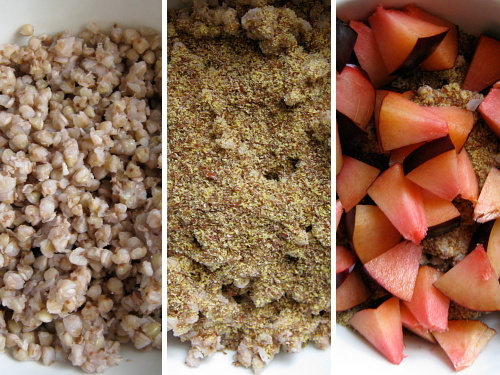 If you cook a pot of grains the night before, this breakfast can be made in the amount of time it takes to cut up a piece of fruit. I thought I’d share it as a reminder of how simple it is to throw together a healthy wholesome breakfast. Put buckwheat and water in a small to medium sized saucepan. Cover and bring to a boil. Then reduce heat and simmer until most of the water is absorbed, about 10-15 minutes. Turn off the heat but leave the lid on to allow buckwheat to finish cooking for another 5 minutes. Serve or pack away for breakfast tomorrow. 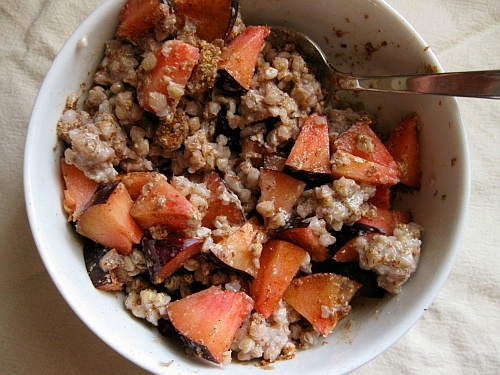 Put buckwheat, flaxseed meal, and soy milk in a bowl. 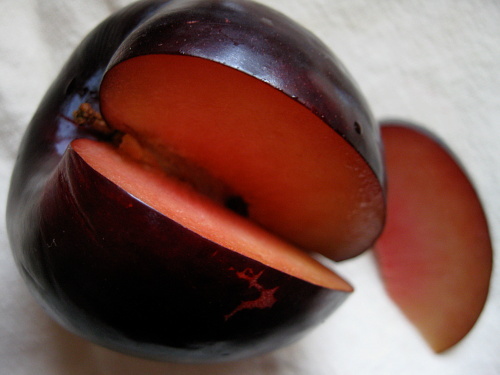 Slice plum on top. Sprinkle with cinnamon. Mix and enjoy. I eat my buckwheat cold. Mike gives me funny looks. He prefers to heat his up. Right now we’re still able to get good fresh fruit. When the winter rolls around I might switch to frozen. (Maybe then I’ll heat mine up.) 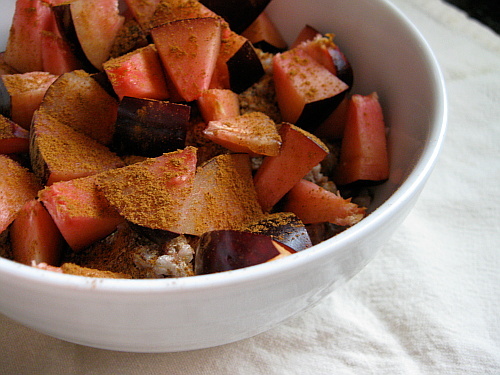 Hot or cold, the important part (in my mind) is to eat a variety of grains and fruits. Mix and match and enjoy! Oh, buckwheat! I’ll give this a try. Buckwheat holds a very special place in Tim’s heart. His family seems to only eat it with savory flavors, though, and they like to add lots of carrots. I’ve been doing warm grains for breakfast ever since strawberries (my summer breakfast) went out of season. Now I have steel cut oats with frozen fruit and almond butter for breakfast every day. I totally recommend it! Frozen fruit works great! 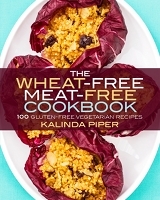 Coming up with some savory buckwheat salads is my next project. I’ve actually been eating savory steel cut oats a lot recently. I eat them cold with olive tapenade and a dash vinegar. (The tapenade I have is rather oily.) I’m kind of obsessed. In the winter when you don’t have fresh fruit, try it with a fruit compote made from dried fruit. If you make both in advance Sunday night, you’ve got breakfast for the rest of the week! Here’s our compote recipe: http://iheartkale.blogspot.com/2008/01/apricot-cranberry-compote.html No work at all! Awesome, thanks Hannah. I do enjoy recipes from you and Phoebe. So far I’ve only tried making compote out of fresh fruits. This is the perfect recipe for winter. What a delighful treat for breakfast & it is also so good for you too! I agree delicious and good for you make a good pair.